Many writers today seem more than willing to sacrifice clarity in headlines for web traffic, but more important still is consideration for the reader’s experience. Like every other citizen of the modern world, I get most of my news online. It should come as no surprise then, that like everyone, I am guilty of headline browsing and article scanning. That’s right—even though I write for a living, I would say that I only actually finish reading about 20 percent of the articles that I start. And that estimate is probably on the high end. That being said, I understand the value, nay the power, of a good headline. Carol Tice once said on her blog that “headlines are everything,” and it’s true that a killer headline can make or break a story. Not only that, but anyone can see how the placement of strong keywords in your headlines is the only way to gain search engine visibility. You need keywords in your headlines. And your headlines need to give the gist of your story without giving too much away. After all, as a writer you want to give the reader a reason to click and actually read your piece, don’t you? But beyond that, things get a little fuzzy. For many writers and paying clients, this is all they need to hear. Unfortunately, some people just don’t care so much about the quality of someone’s writing as they do the visibility of their articles. Let’s face it—the purpose of a company blog is never simply to provide information to interested parties, but more so to drive traffic to the company’s website and convert that traffic into sales. Many business owners will tell you point-blank that they prioritize clicks over clarity. Thus, when someone begins the process of looking for freelance work they inevitably find a vast array of paying gigs with high minimum keyword saturation requirements—jobs that can be pumped out relatively quickly at a few dollars a pop. But hey, with a little bit of luck a whole heap of these gigs will keep the lights on, right? This thread of logic, though, gives rise to a question about the real importance of visibility. Obviously, without visibility you have no traffic. Without traffic, you have no readers. And without readers, you will have very little success attracting clients. Fair enough. Being fairly new to the professional writing game, I have to admit that I have been tempted by the myriad of low-paying, low-quality marketing work that seems to dominate the scroll-space of freelance job boards. It is an alluring option to take any paycheck for your work, no matter how low-paying or lowbrow, if it means you might get one of those coveted bylines you’ve heard so much about. “It’ll help me get the jobs I want down the road,” you tell yourself. But it’s a lie. You may not know it yet, but it is. No online marketing campaign, no matter how brilliant, nor email blast, no matter how succinct, will qualify you to write an article for a national magazine. Even though you might feel that much closer to your goal having a paid sample on your website, the reality is that while you are spending your time cranking out low-quality assignments one after the other, those high-end opportunities are just getting further and further out of reach. Unfortunately, fellow freelancers, the truth is that run-of-the-mill product descriptions and press releases will only help you to win more run-of-the-mill projects down the line. To make the next big leap requires incremental progress, and is in fact rarely a leap at all. Rather the journey to freelancing success seems to be more like a carefully plotted series of steps through a minefield of rejection, coupled with the constant refinement of your professional process. To compromise on the quality of your work in favor of volume will help you build a large portfolio quickly, but at some point you will be forced to look at that portfolio and decide if the writer it defines is the one you intended to be. So yes, visibility is good. But only if it is good visibility. And so, we come full circle to headlines. Last week I came across this story about a poison pill defense strategy employed by Safeway. With images of espionage dancing in my head, naturally I clicked the link. What appeared you can see below. 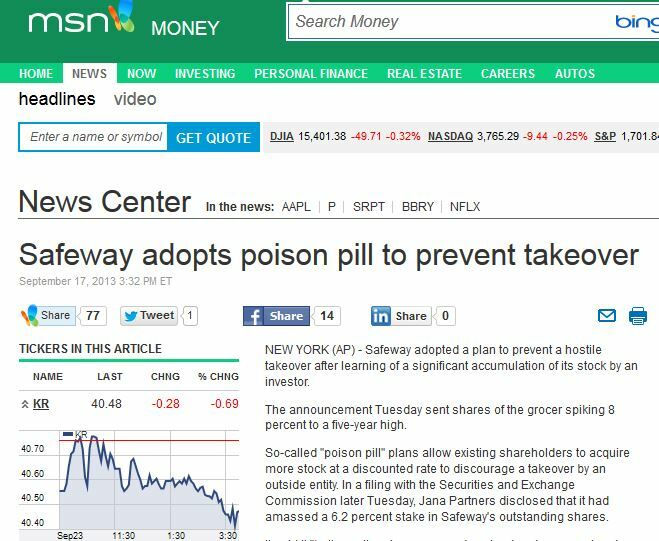 The top result (probably not coincidentally from MSN) seemed to confirm my suspicions—Safeway executives had developed a way to use a real-life poison pill to prevent a takeover. Sweet. Even the sub-header failed to say much more. It was not until I clicked again that I learned, in the body of the article, that a “poison pill” is actually a financial strategy. A company that uses a “poison pill” plan opts to sell stock at a discount to current stockholders in order to prevent a third party company from gobbling up too much interest and, in effect, taking over. I suppose it was a little stupid, or at least naïve of me, to assume that Safeway had decided to use an actual poison pill to be taken by, say, a manager in the event of a hostile takeover by, say, Al Qaeda. And in truth it had not crossed my mind that terrorists might not target a grocery store for a takeover of any kind—but man, that would’ve been a story, wouldn’t it? The person that wrote that headline got me to click their link. Objective complete. But when I found out that I had been misdirected into landing on a page, my feathers were admittedly a bit ruffled. I complained out loud to no one in particular and moved on. But then I got to thinking. Maybe it was a slipup, the lack of quotation marks around the short phrase “poison pill” a simple grammatical snafu. But no: within the article itself, in the third sentence, is an indirect admonition of the tactic (pictured below). 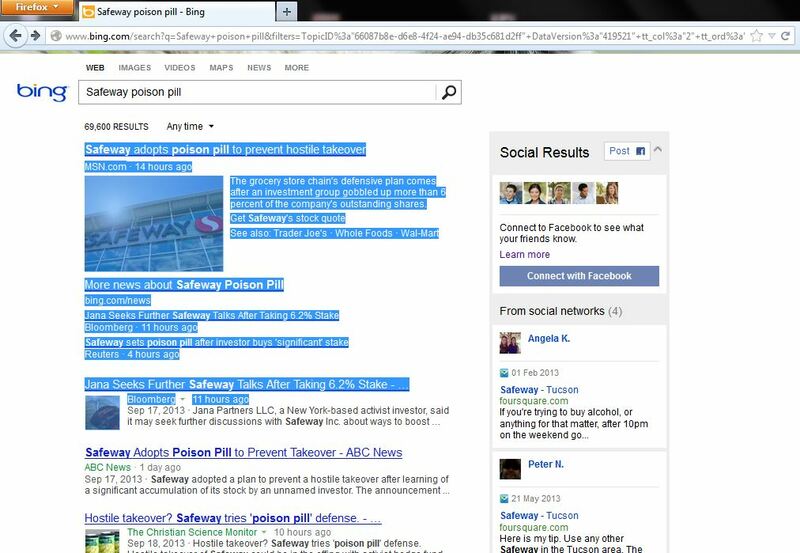 When I looked again at the “Safeway Poison Pill” search results, I saw that the folks at Microsoft weren’t the only ones to sacrifice grammatical accuracy in favor of potential web traffic. In fact, not until I got to the bottom of the screen to the article posted by the Christian Science Monitor—the sixth most popular result for this particular search—did I find a headline employing the proper use of quotes to indicate the type of “poison pill” in use. Perhaps I should have known that a poison pill was not really a poison pill, but rather a “poison pill.” I will accept that criticism. Silly me. But I am not a financial expert and, as such, have never heard that term used before. I assume the majority of international internet users would find themselves in the same crowded boat. And yes, MSN got some traffic—at least my click—by employing clever, perhaps even sneaky, headline-writing strategies. I am willing to bet that loads of other people had the same experience I did with that particular headline, though this is not something I can confirm. But I left that page with the slightly nauseated feeling of having “been had”. And though I may have never remembered that it was an MSN article that made me feel so intellectually violated had I not taken a second look this time, but a few more of those moments and that site may have soon found themselves with one less reader. The less cynical side of that same coin (let’s call it “heads”) is this: with articles that readers feel are engaging, interesting, and straight-forward, they take note, often both of the writer and of the site that published the content in question. Those writers and publications get higher preference within our own personal article selection criteria—more of a selective style of search-engine use than any practical application of SEO, really, but far more relevant to each of us than any amount of obvious keyword-cramming. I think it is important to keep this in the back of my mind while I’m writing whatever it is that I may be writing at any given point, especially as it applies to headlines, because that is the type of work I want in my portfolio. Because I want my readers to know what they are in for when they click on one of my stories, and I want them to enjoy reading it when they get there. But mostly I think of this because, when it comes down to it, even if I never get a single writing job based on my portfolio alone, I’m still always going to have to live with it.